Above: A poem written on a paper airplane, a prototype for "Skywriting: Poems & Planes," a workshop to be held Saturday, May 28 at the Poetry Barn in West Hurley. Photo by Lissa Kiernan. Poet and teacher Lissa Kiernan makes her students’ poetry fly, both literally and figuratively. On Saturday, May 28, from noon to 5 p.m., she’ll bring that skill to her new venue, the Poetry Barn in West Hurley, with inaugural course “Skywriting: Poems & Planes,” the first of several “Last Saturdays at the Barn” events. And the poems will, in fact, fly. To explain how the work will defy gravity, Kiernan, a recent émigré from Brooklyn, met Watershed Post for coffee at Bread Alone in Boiceville, and gave a brief history of the building. Above: Chris Abramides and Lissa Kiernan. Photo by Chris Abramides. This class and the Poetry Barn are a homecoming of sorts for Kiernan. In the 1980s, she graduated from UMass Amherst with a BA in English and Writing and subsequently spent decades living in Brooklyn, working in Manhattan, and getting swept up in an urban lifestyle. 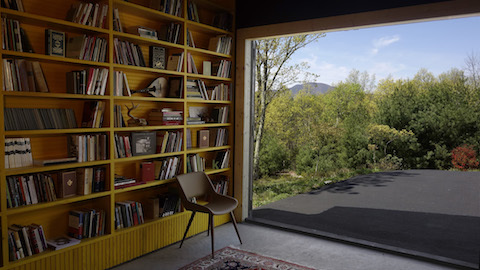 Above: The Poetry Barn. Photo by Chris Abramides. Kiernan was an early devotee of the internet. In a twist, the internet would bring her back to poetry. In 2003, grief-stricken after her father’s death from a brain tumor, she found solace in the abundance of contemporary poetry book proofs freely available at her job. She returned, tentatively, to composing verse herself, as well as to write the occasional poetry and music review under the BN.com byline. In 2004, the 24-year-old Perspectives founder Kristin Biss died from bone cancer. Devastated, but determined to carry on Biss’ nurturing, web-based work, Kiernan accepted an offer from poet Susan Yount to edit Yount’s site, Arsenic Lobster Poetry Journal. 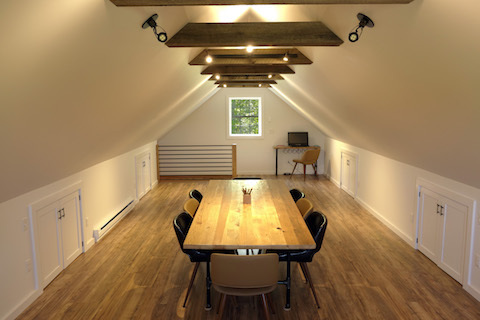 Above: The second floor writing workshop space at the Poetry Barn. Photo by Chris Abramides. “We followed the seven principles of cooperatives, which include building community, working collaboratively and educating,” she said. Prices varied from free to $350 for once-a-week, four-week courses. “The classes were themed,” Kiernan said. “Nuclear poetics, the grotesque, magical realism.” To her great delight–but not surprise–attendees to TRM online workshops were often published, and occasionally awarded. After “Skywriting: Poems and Planes,” which Kiernan will oversee, the Poetry Barn will hold workshops on the last Saturday of every month through October. 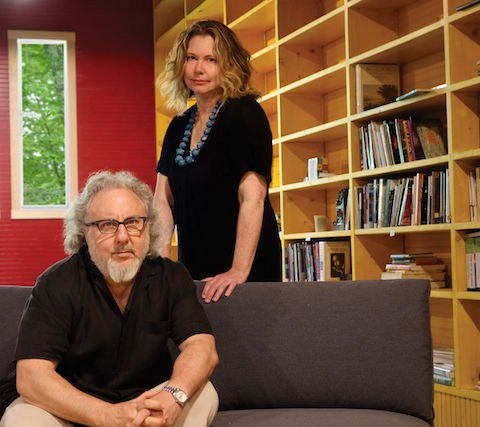 On June 25, Kiernan and poet Tina Barry conduct “A Feast for the Bards: Farm to Table Poetics,” the proceeds of which will benefit the Reservoir Food Pantry. Future workshops focus on bookbinding, haiku and acrostics. In the meantime, Kiernan is stocking the Poetry Barn with books, looking for donations and canvassing library sales. 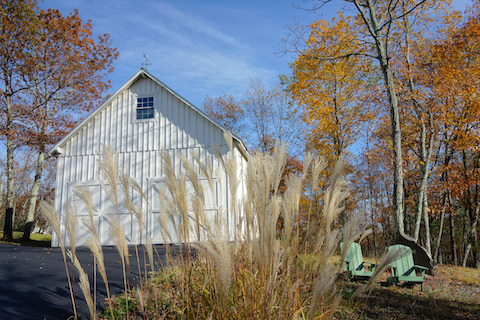 “Skywriting: Poems & Planes,” a workshop at the Poetry Barn. Saturday, May 28, noon to 5 p.m. 1693 Route 28A, West Hurley. poetrybarn.co.